The mystery of the source of character is not to be solved by looking at the personality, but rather by a self-examination of the character of the soul. When we use the term individual soul, as in the case of the human being, we are talking about the reincarnating Ego that has been experiencing life in different personalities, different nations and different races. In spite of all the differences in the outer character of personalities, nations, and races, the reincarnating ego has developed through the process of evolution an individual character of its own. 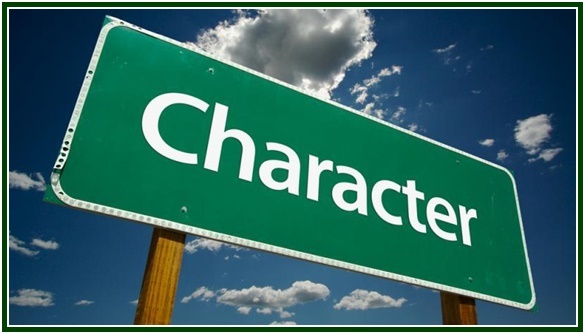 Although education and heredity can have a little influence on the direction and expression of character, it does not explain the essential nature of character. The essential nature of human character includes thought, feeling which is the essential operating desire at the heart of every human being, and the Will force or motivating spiritual power which compels us to move forward in evolution. We are all Divine in our essential spiritual nature, because of the oneness of our spiritual nature with the one universal, eternal Deity. The human beings living now in every nation and race, who have ever lived on this planet, or who ever will be living on this planet, are essentially gods in essence and potential. So we are not speaking of divine character, as that potential is the same for every being. We are speaking of the developed individual expression of that divine character. There is the potential awakening of the light of the spirit, or Atma, in the darkness of every human mind. It is potential because its presence and influence will depend on how suitable the mind is as a vessel to receive and share the light of spirit. This vessel of mind is made up of thought, desire and Will. There are certain ideas, desires, and applications of will force that define the character of every human being. In our essential soul character we are warriors, priests, servants, and merchants. In each of these aspects of essential soul character we differ in idea, motive and will force. In essence, we all have the character of being a fighter, a warrior. Some of us are more intense fighters and warriors than others; that’s the individualized expression of will force. Some of us will fight only for ourselves. Some will never fight for themselves but only for others. They are willing not to fight others if it means they have to defend themselves from personal injustice. That difference in motive is the heart aspect of our warrior character. We all fight for a reason, or idea. Some of us have to fight to draw the next breath, or have to fight in order to live with constant pain in the body. Some of us have to fight to get up and go to work in the morning because if we don’t, our families will starve. Some of us feel we have to fight against injustice or against the imperfections in ourselves. It is the same essential warrior characteristic, but the way we express it is different. Nobody teaches us that. We come into life, and we already carry with us, in our individual soul character, the will, desire, and idea we are capable of fighting for; where we’re going to take our stand. Another aspect of our essential character is that we all come into life with a sense of devotion or faith. It is a high ideal; something more than ourselves that we are willing to devote our lives to. It is a manifestation of the priestly aspect of soul character. Some show that in a religious form; some show it in practical charity, in work for others. Some show it as a devotion to truth, or wisdom. There is a devotion or a faith that we each one carries in a different way. Yet no one taught us that. We come into life with a soul character that determines what we are going to be devoted to in our lives, so much so that we can be born into a very orthodox, conservative religious family, and if that expression of faith doesn’t resonate with the devotional element of our character, what do we do? We break away, and everyone wonders how we got into that family. We all come into life with the essential character of being a servant in some way. Some of us just want to serve our families. Some of us want to serve the community, serve the sick, in whatever way. But we all have some cause or someone for whom we are willing to put ourselves at their service. We don’t expect anything in return; we just feel this is where we need to be to help. Nobody has to tell us. We all come into life with an essential character aspect that enriches the lives of others, whether it is by the spreading of wisdom, money, care, or just a simple genuine smile. This merchant aspect of essential character improves the life and the conditions of others through the give and take of items of value. It may or may not be material wealth. It can be spiritual wealth. That is up to us and is determined by our soul character. Again, no one teaches us that. Some of us have a balanced mixture, a blending of these different character aspects, and some of us have a few of these aspects that dominate our essential character. We might be great fighters but we are also great peacemakers, so they balance each other out. Where does that come from? It can only come from many lives of development of the essential character of the reincarnating ego in one way or another. It is very important that we examine the nature of our individual soul character, because character shapes one’s destiny and interaction with others. The character of Theosophists in their collectivity, shape in part the destiny of the Theosophical Movement. It is also important that we try to understand the essential soul character of another, so that we can relate to them impersonally and compassionately as souls in evolution. How are we different or alike as warriors, priests, servants, and merchants? How can we work in harmony with those whose character is as willful as ours, but different?